Moved to the opener. Prior to the match, a moment of applause was held for the recently deceased Chavo Guerrero. Soul Rocker got a very rare pinfall win, fouling Bengala to accomplish it. It's Soul's first TV win since May. Mini Abismo was replaced by Mini Psicosis, in his first TV appearance since 2013. Psycho beat Dinastia and (again) challenged him to a title match, but so did Octagon & Mini Psicosis. Super Fly moved out of the way of an Aerostar tope con giro, and Aerostar was hurt. He was stretchered out, and Carta pinned Argenis. Billed as a trios match with OGT & the Apaches. No reason given why Marvin & El Apache were missing, or why Cuervo and Scoria were added. They won in their first TV match since Zorro quit AAA. Texano Jr. & Hijo del Fantasma replaced Daga & Pentagon Jr. on 01/25. They got the win when Mesias & Pagano had issues. Pagano was going to splash Fantasma thru a table when Mesias pulled him off and Pagano went thru on his own. Fantasma beat Pagano with the Thrill of the Hunt. Dr. Wagner replaced Dave the Clown on 01/25. Monster & Murder betrayed Wagner (no explanation) but Wagner still beat Psycho Clown. 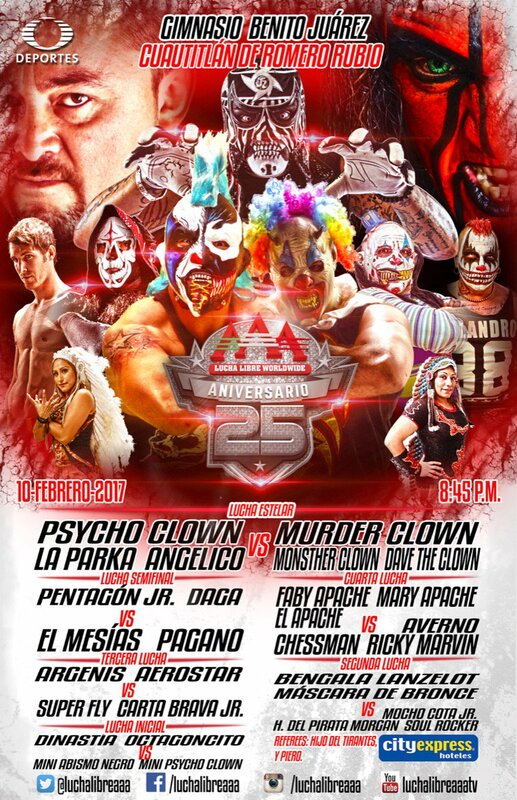 Wagner declared nothing would stand in his way of getting Psycho Clown's mask at TripleMania.